Jackson remains under a Pentagon inspector general investigation for misconduct. Remember former White House physician Rear Adm. Ronny Jackson? President Donald Trump has promoted him and wants him to get a second star -- a higher military rank -- as well. But when the president has his annual physical on Friday, it won't be Jackson who's in charge of the checkup this time around. It was last January when Jackson, then the top physician in the White House, declared to reporters in a briefing that Trump "has incredibly good genes” following Trump's physical at Walter Reed National Military Medical Center. It was seen as an unusually glowing and public declaration of a president's good health after questions were being raised about his mental health, his weight and eating habits. (Tom Williams/CQ Roll Call via Getty Images, FILE) Rear Adm. Ronny Jackson, nominee for Veterans Affairs secretary, leaves the Dirksen Building after a meeting on Capitol Hill with Sen. Jerry Moran on April 24, 2018. Shortly thereafter, the president first nominated Jackson to be promoted to a second star. The president also tapped him to lead the Department of Veterans Affairs, although he had no experience running such a large government agency. Jackson ultimately withdrew his name from consideration after allegations of misconduct surfaced, including the improper dispersion of medication and the mistreatment of White House colleagues. Those allegations, which Jackson denies, remain under investigation by the Department of Defense Office of Inspector General. 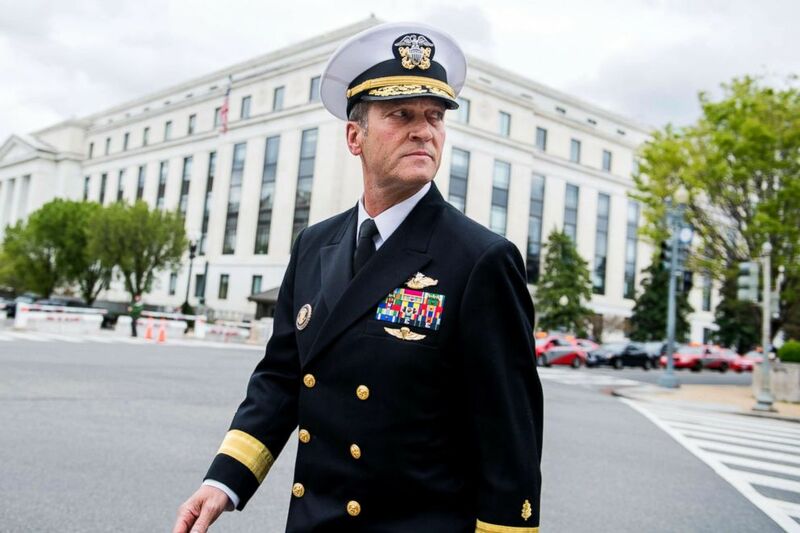 After the allegations surfaced, Trump said he would "always stand behind" Jackson, but, to avoid further public scrutiny, the president suggested that the admiral withdraw his nomination for VA secretary. In the months since, Trump has often seemed to make it his personal mission to salvage Jackson's reputation, calling him "the most clean-cut, wonderful person." He campaigned against the Democrat who played a role in stopping Jackson's nomination - Sen. John Tester, the Ranking Members on the Senate Veterans Affairs Committee. "All of those horrible things that were said about him turned out to be lies," Trump said about Jackson while attacking Tester, despite the ongoing investigation. Following the botched nomination, Jackson quietly returned to the White House medical unit, though not in the top job as the president’s principal physician. That position was assumed by Dr. Sean Conley, who first stepped into the role when Jackson was nominated to the VA. But over the weekend, with his latest physical about a week away, the White House announced that Trump had appointed Jackson to a newly created role: Assistant to the President and Chief Medical Adviser. In that position, Jackson will no longer be providing medical care at the White House but instead will provide "technical policy advice" on public health issues within the administration, according to an administration official not authorized to speak publicly about the matter. Jackson's policy portfolio will have a particular focus on veterans' issues, the opioid crisis, and health issues as it relates to the southern border, and he will travel and work closely with policy-focused staff on those issues, the official said. In defending the appointment, the official noted that Jackson is an "excellent physician and trusted medical advisor" who previously worked as the White House doctor for former Presidents George W. Bush and Barack Obama. Jackson’s promotion within the White House came soon after the White House had also resubmitted Jackson’s previous nomination for a second star. A White House official downplayed the decision to resubmit Jackson's nomination for a second star because Congress did not take action on it last year. But last year's nomination came before allegations of misconduct regarding Jackson had surfaced and the consideration of Jackson’s nomination was effectively put on hold. Jackson can earn his second star while under investigation, but each promotion is dealt with on a case-by-case basis, a U.S. Navy official told ABC News. The Chief of Naval Operations, Adm. John Richardson, told reporters last week that the move to resubmit Jackson for a military promotion was not a Navy decision. “The White House is the one who resubmitted his nomination to the Senate and so we’ll see -- there’s an investigation going on, that’s in progress so all of these things have to kind of culminate to see where we go," he said.